USA Hoist has received the subcontract to install two dual hoists for Lendlease on the 160 Folsom project located in San Francisco. We are currently underway on preparing engineered drawings for this challenging project. USA Hoist will be installing a dual MEGA – 10,000lbs capacity man lift for the project located in the heart of San Francisco, California. When completed the residential tower will stand over 400’ tall. 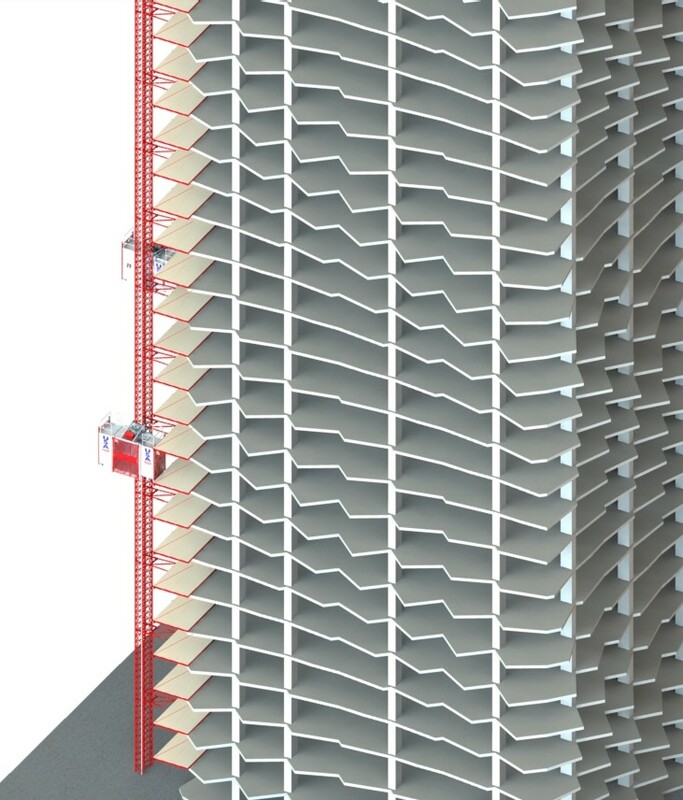 The tower presents many challenges not only for Lendlease but for the hoist/man lift supplier, as you can tell by the renderings and 3D drawings provided by USA Hoist. Each floor has a different profile causing the need for specially designed cantilevered landing and lookouts. The tower itself has a jagged uneven finish that spirals from the ground floor to the roof. USA Hoist specializes in these types of projects, which require out of the box thinking and ideas. USA Hoist is excited to show case these MEGA Hoists and special landing platforms. Please check back in for updates as this project gets underway.